Station 6 Deputy Station Commander – Justin Erasmus (in bow) prepares to release African Penguins. At 09h00 this morning, 15 August 2016 NSRI Port Elizabeth duty crew launched the Sea Rescue boat Eikos Rescuer IV to assist SANParks with the release of 72 African penguins back into their colony on St Croix Island. 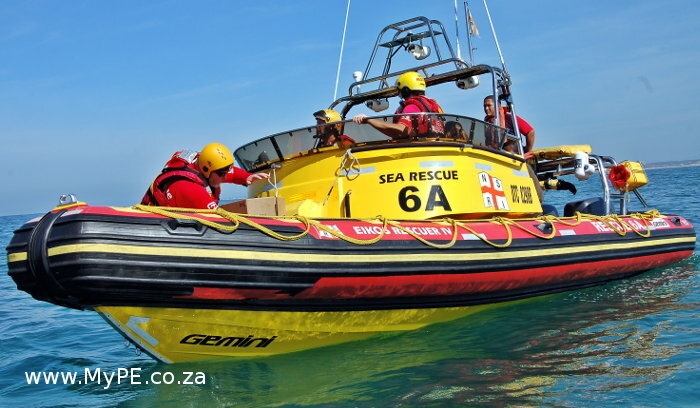 The Sea Rescue volunteers rendezvoused with a SAN Parks vessel and SANCCOB at the Port of Ngqura. The penguins in their boxes were loaded onto the Sea Rescue vessel, the SAN Parks boat and “Xtreme 6” (a 8.5m RIB kindly loaned by Kevin Kelly of Xtreme Projects to assist with the operation) and taken from the Port to St Croix Island. Sea conditions were calm and conditions for the release was very good. The birds were released from the boats into the water without incident.